Fiberglass. Pad is heat-bonded to handle. Handle is plastic. 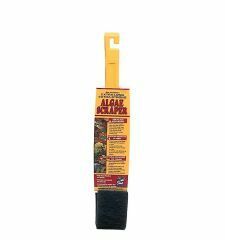 Aquarium Pharmaceuticals - Algae Glass Scraper - 18 Inch product is categorised under Wholesale Aquarium Pharmaceuticals Inc products, Wholesale Aquarium Products, Wholesale Accessories.